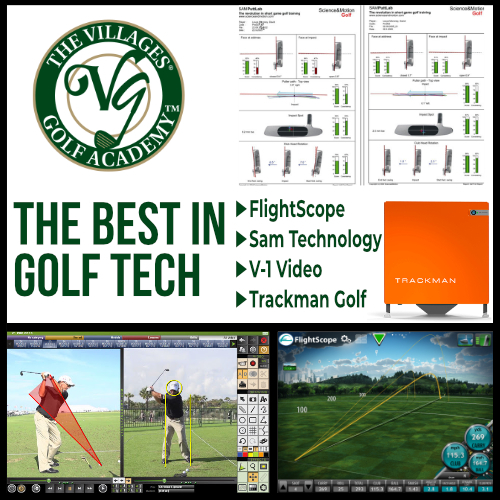 The Villages Golf Academy is proud to offer our students some of the finest technology available in today’s market. To help our students in their pursuit of a better game or finding the correct golf equipment we have chosen two of the golf industry’s leading launch monitor companies … TrackMan and FlightScope. Video technology has been used in golf instruction for several decades. The Villages Golf Academy has partnered with V1 Sports Technology, one of the leaders in video capture software and high speed cameras. This invaluable tool helps the student see exactly what they are doing, it also gives our instructors the ability to diagnose faults and recommend swing changes much quicker than ever before. Part of this exciting platform is the ability to store a student’s golf swing for future reference. Whether this is to compare to their next lesson or to email to their computer or smartphone so they never forget what their last lesson entailed.